Go Green! Cycle to College! Feeling tired? Go for a ride! Sounds counter-intuitive, but a few minutes on the bike is a surprising wake-up call. That’s just one of the benefits of ditching the car, the bus or the train and cycling to College. Of course, it’s good for you, good for your wallet, good for the world! Cycling is great for your fitness and for your mood. It’s a great way of de-stressing, especially with exams coming up! It also gives you great freedom and during rush hour it can be faster than driving or taking the bus too! As if that’s not enough, cycling has become very fashionable now too. The College is getting right behind this idea. There is a Bike User Group of staff and students who meet regularly to promote cycling at the College and students who are appointed as Cycle Champions. Anyone wishing to join the Bike User Group can contact any of the Student Development Officers for more information. 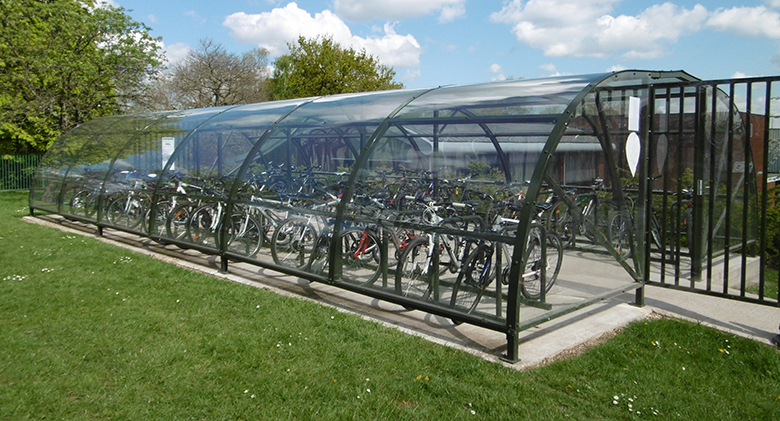 Also, with the aid of a grant from Transport for West Midlands, a brand new bike shed has been built at the College, so as well as the financial and health benefits of cycling, students (and staff) have a safe place to lock up their bikes too! Bike Right West Midlands – students and staff can come to any of Bike Right’s cycle training and maintenance sessions. Although car parking space is tight at the College, a limited number of parking permits are available to purchase. If you have a current blue disability badge, parking will be free of charge. Otherwise, parking does incur a fee and is charged termly (working out at £2 per day) and permits will be issued on a first come, first served basis. Charges are made for the whole term (not on a day-by-day basis) based on the number of teaching days per term with the exception of term 3 where a reduced cost is applied to reflect the exam period. Students can choose to pay £324 to guarantee a space for three terms or choose to pay termly (Autumn Term: £156; Spring Term: £130; Summer Term: £38). Payment can be made by Parentpay, cash or cheque. Please contact the Central Admin Office (in Meriden) for further details.